This workbook contains 24 worksheets with activities associated with each lesson. 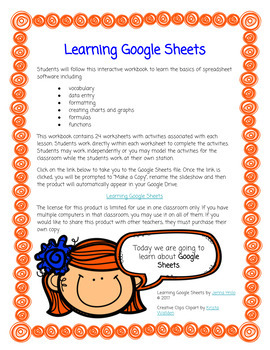 Students work directly within each worksheet to complete the activities. Students may work independently or you may model the activities for the classroom while the students work at their own station. The license for this product is limited for use in one classroom only. If you have multiple computers in that classroom, you may use it on all of them. If you would like to share this product with other teachers, they must purchase their own copy. 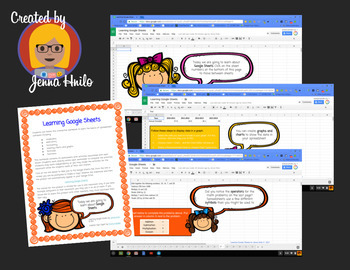 Learning Google Sheets by Jenna Hnilo © 2017. All rights reserved.